[CONSTITUTION]. Newspaper. 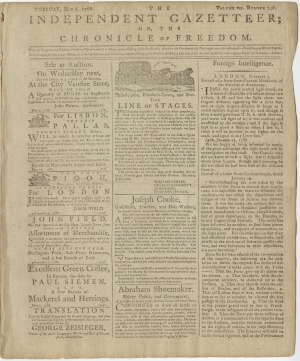 Independent Gazetteer; or, The Chronicle of Freedom, Philadelphia, Pa., May 6, 1788. 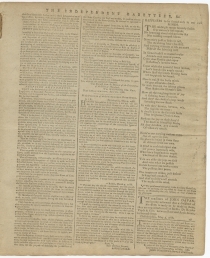 4 pp., 9½ x 11½ in. That Congress have no power to lay a Poll-Tax. 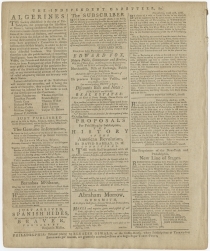 WHEREAS, in the year 1787, some vessels were fitted out at the port of Philadelphia, for the iniquitous purpose of stealing the inhabitants of Africa, from all the endearments of domestic life; one of which vessels has succeeded in obtaining a number of poor blacks, and has taken the to a port in the West Indies, where they are under the iron hand of oppression. From this shameful traffic, this horrid source, the proprietors of the vessel have purchased some West India produce, which, after landing at Wilmington, they have brought up to this city, and offered for sale. 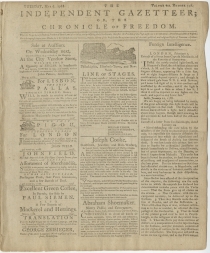 It is a grateful circumstance to the supporters of the common rights of mankind, that the virtuous inhabitants of the city, reprobate the horrid idea.—A correspondent hopes, that the citizens will further testify their disapprobation of the practice by turning with indignation from the purchase of any property, thus basely procured by men so lost to the common feelings of humanity; notwithstanding the patriotic convention, at which Washington presided, have declared that this abominable traffic shall be continued for TWENTY years by the people of America. An advertisement with engraving for a “Line of Stages” between Philadelphia and New York, started by four partners who split off from an established stage line and promising better service. 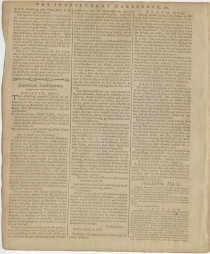 And a report on the creation of a Philadelphia committee for the relief of the nearly 100 Americans captured by Algerian corsairs and Barbary pirates.